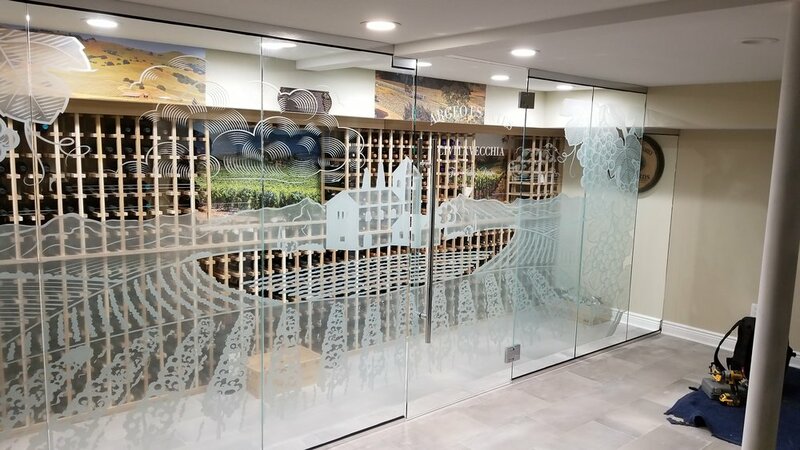 Our wine cellar project took simple elements of glass and stainless steel; then added a huge splash artistic ability with our sandblasted landscape of Tuscany wrapping the entirety of the cellar wall. The partition consisted of 1/2" clear tempered glass, minimal track to house said glass at head and sill and CRL Self Closing Hydraulic hinges. 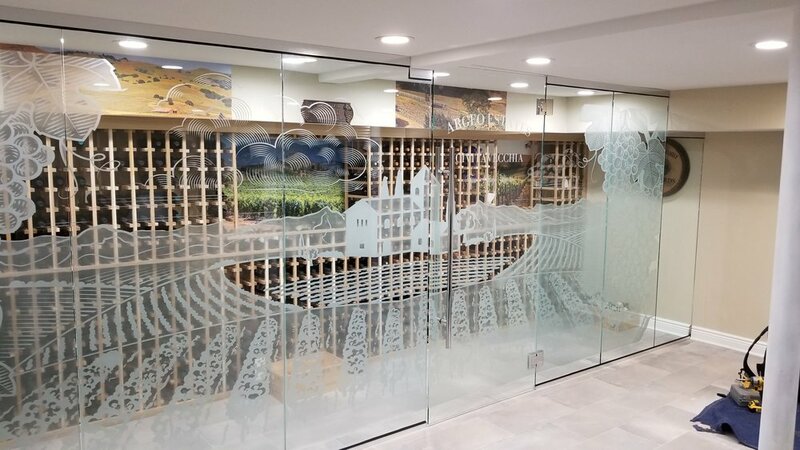 Here ACSM wanted the artwork and bottles of wine to be the focus of this entry; which we executed flawlessly. ACSM provided replacement window services by removing the original steel sash windows and installing black center-glaze aluminum framing with 1" glazing pockets. Glass provided had 5/16" white laminated glass over 1/4" clear tempered. The inner layer had a SDL(simulated divided lite) matching the grid pattern of the original steel sash windows. The glass design was functional from a safety perspective and is aesthetically pleasing to the eye. In addition, we installed a glass partition wall to envelope a conference room; giving the space the privacy and high-end look matching the office decor. 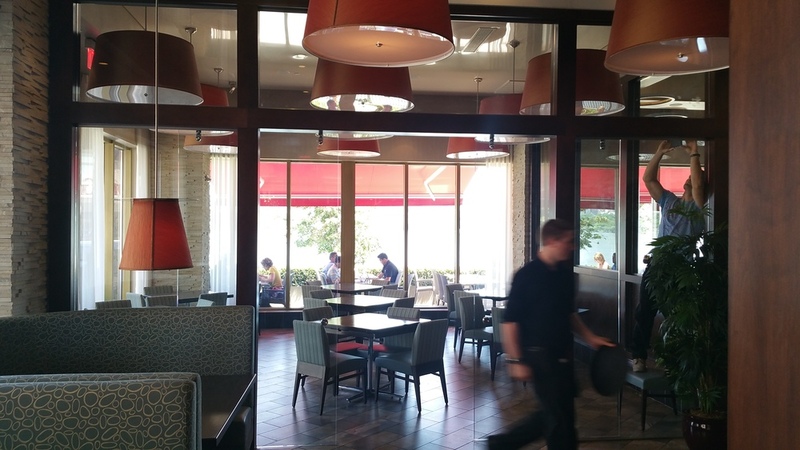 At the 'Restaurant', ACSM installed a CRL Laguna style framless sliding door system in the clients ready-made stained-wood openings. The rustic feel of the wood is greatly complimented when it sits alongside the industrial stainless steel CRL Laguna sliders; marrying the two design elements of old & modern in stunning fashion. On this project our client, Marriott Hotels, tasked ACSM with putting the finishing touches on their new lobby expansion. ACSM installed CRL Glass Wall Partition Systems and frameless doors to finish off the space creating a division between spaces while maintaining the open feel. In addition to glass and metal, ACSM provides stick on vinyl film services for customer's designs or logo. The scope of work performed on this project included: design & build, demolition, fabrication and installation of ACSM storefront hardware. ACSM can provide, as in this case, the assistance of designing products catered towards our clients, with their direction in mind. On this 6-level luxury condominium, ACSM was tasked with glazing over 350 windows provided by Marvin Window Manufacturers. With exposures to the NYC skyline and striking views of the Hudson River, this project became the perfect opportunity for ACSM to flex their muscle by delivering a great product with a superior installation that saw completion on time and within budget; two things that come standard when you hire ACSM. At the 'Mountain Home', this particular occasion saw the owners of this beautiful home in dire need of help approach ACSM to handle the correct and proper installation of their curtain wall. The original glazier the owners hired left the curtain wall in unfinished and unsafe condition. To add insult to injury, the installation was also performed incorrectly. ACSM has continuously shown a proven track record of fixing improper installation procedures, and this project was no different. Once completed, this homes enormous exposures to the beautiful landscape were installed correctly, safely, and sealed from the outside weather elements. If you've been taken advantage of by bad contractors, ACSM is here to help! 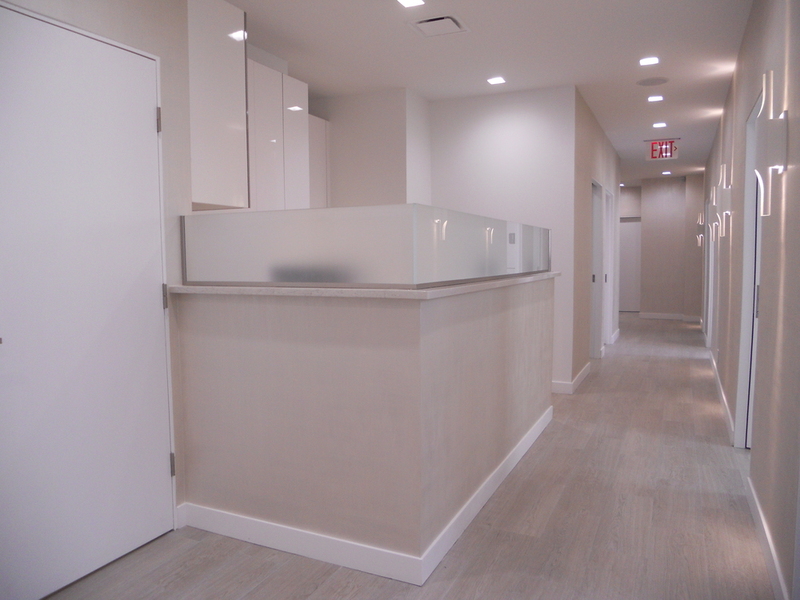 For the 'doctor's office', ACSM worked hand-in-hand with an interior design firm to make this cutting edge doctor's office stand above all the rest. This project was a particularly fun one because ACSM got a chance to flex it's muscle with regards to our products and services suite. The office had just about every product or service we provide from mirrors to entrance ways. In this photo gallery you will find examples of all the work we performed. Products included: stainless steel entrance door, a frame-less shower door, aluminum framed mirrors, sliding glass doors, Frame-less Entry Way door, acid-etch glass wall coverings and acid-etch glass sneeze guards. On this project, we outfitted an office with frame-less glass partition conference rooms and single offices. The doors installed were custom and outfitted with stainless steel furnishings. In addition to the conference rooms, ACSM also installed a pair of top & bottom rail glass doors with concealed overhead closers. For this project, ACSM was tasked with replacing a fitness center's bathroom mirrors. This wasn't the most difficult project we have worked on to date, however the replacement mirrors we installed helped give the locker-rooms the face-lift they deserved; looking like the very first day the gym opened its' doors.